Also nodding my head about the notion of living in celebration within a frenzy of activity. These days, I’m moving so much slower than before, but even so, there are days I push myself, just taking delight in the simplest of things that can be accomplished when you are in a state of meditation, accomplishing some sort of task or another. Really focused and engaged. For instance, I spent several hours yesterday putting together my Easter gift baskets for my great-grandsons (I have two of them, ages 2 and 3). Sure, I could have thrown it all together and been done with it, but it was far more satisfying to linger over the process, sort of like arranging flowers in a vase. A bit of color here, a tiny toy there, a hidden surprise over here, and a few little treats to fill in any empty spots. Some healthy snacks, plus one special toy unique to each one, based on their current infatuation with whatever Disney movie or cartoon they favor. For one, it’s Paw Patrol. The other? All about the Minions. To be honest, I’ve never seen a single thing having to do with either one (movie or cartoon for Paw Patrol or the Minions), but if it appeals to them, then I enjoy adding that special little touch to their gift baskets. My way of acknowledging how they are both unique. It was an enjoyable way to spend several hours dawdling and arranging the items in their baskets. When I finished, I was well pleased with the outcome. I have three grand kids, who are all in their early 20’s now. My grand daughter (22) has a 2 yr old son, and my grandson (24) is with someone who has a 3 yr old son, so I ended up with a bonus great grandson! Grand kids (and great grand kids) are just the best. Great ideas for the baskets…definitely stealing your bandaid idea. Easy to buy, and no one ever has enough bandaids. I always seem to be out of them just when I need one. You are blessed with children…yes, a bonus in another great grandson…and they are blessed to have you. A great quote! 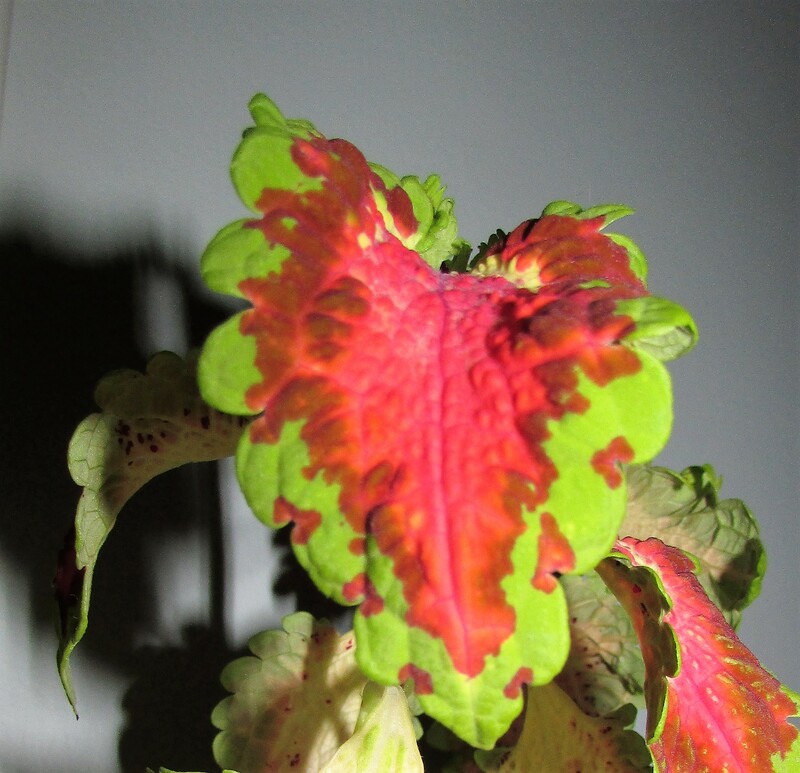 Your coleus are inspiring me. I thought so too! So often having too much fun and too many treasures is criticized…my treasures are not worth a lot, but they are precious to me. Thanks! The babies will develop better colors as they get older. They start out with muted colors and as they get larger get more brilliant. Those are beautiful! I usually start lots of things from seed for my vegetable and flower garden. This year, due to surgery, I did not. It is sad not having the little seedling around. Love to see yours! Thanks so much…I enjoy the process start to finish…the sprouting of the seeds all the way to collecting them in the Autumn for new the coming year. Love all the Coleus flowers. You will be getting a few for your porch. They should do well out there! Your coleus ( colei ?) are beautiful. And your thoughts on why you have so much. I loved it. And you gave me an idea for a book to read too, I think I am going to look for ” One woman Farm” too. I haven’t done any planting this year and the spring here is nearly over, so I am too late but perhaps not too. I spent the time on my daughter and in good time, perhaps the harvest will come. Love your ideas for Easter baskets for your grandchildren- here again you are investing time and love on these precious ones’. Your post led me to another thought as they do often – in life we invest our talents and our God given love and our inner most spirit in whatever the Spirit leads us on to and there comes a time, when all of our investments or seedlings have grown into plants and are ready for harvest. At that time we will be harvested for the vibrant colors we show, the seeds we have produced, the love we have sown and so much more. Isn’t that a glorious thought ?